Шибито vs. Ямибито. Кто круче? 1970 - Ore gradually dries up; other issues besides...? Yamijima is a place that has felt the influence of a supernatural being called Annaki (and the things created from its bones), and as such has been feared since ancient times as "the island of darkness", "island of the underworld" and "the taboo island". This is due to the fact that Mt. Shinari in the centre of the island and the Mekkoju, which exists in the World of Nothingness, were once overlapped in their dimensions, leading the islanders to develop unique traditions and legends involving "impurity", and several strange incidents such as the mass disappearances and undersea cable cutting of 29 years ago occur on Yamijima because of the special location in which it is positioned. The people who appear in Siren 2 are all swept into the Yamijima in the Reflected World created by Mother by a huge, red tsunami that occurs along with a siren at midnight. Escaping from this illusionary island becomes the story's ultimate objective. 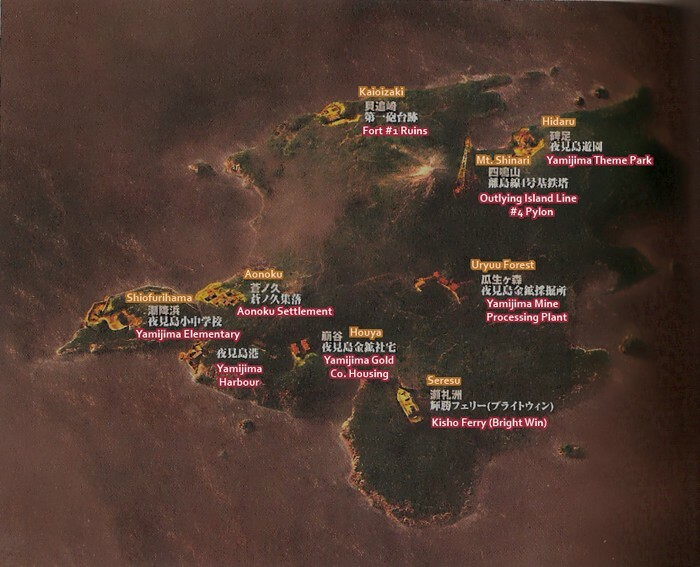 Yamijima, the setting of the story, is a phantom island created by Mother, who lives in the "World of Nothingness". In the ancient past, the "ancients" fled to the World of Nothingness, where no light could reach, to escape the Flood of Light, and lost their form, melding into a collective consciousness - Mother - and falling into a deep sleep. Since there are rifts in the borders between reality and the World of Nothingness (due to environmentally-damaging construction taking place on Yamijima's forbidden land and flotsam drifting through from the World of Nothingness), Mother awakens and creates a special, temporary environment - the Reflected World - in order to mingle with humans and other beings with concrete forms; inside this world are a copy of the real-world Yamijima, and the Netherworld. Since nothing in the World of Nothingness is able to maintain its form, Mother, the Mekkoju and everything else in it must originally be abstract beings (they are conceptually bodies of energy). However Mother, who wishes to return to the real world, uses her supernatural powers to maintain a form in the Reflected World. This is against the laws of the World of Nothingness, causing it to lapse into an extremely unstable state. 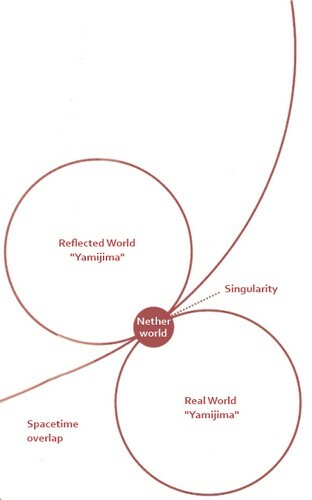 Due to this, special dimensions appear and disappear like bubbles: areas of space (overlaps in spacetime) in which time itself completely fails, where anything can exist, and a hypothetical space in which a rift between the real world and nothingness cannot exist (Singularity). It could also be said to be a power that is unfathomable to human logic. The Reflected World adheres to the Yamijima of 29 years ago, and so although sometimes temporary additions are added its basic nature remains unaltered, a word which tries to return itself to how it was. However, due to external factors (such as the actions of people who become trapped on Yamijima, etc.) it is possible to affect the top layer of the world that tries to revert. Having confirmed the presence of humans at 6:00 Return of the Dove, Mother opens the door to the real world and prepares to infiltrate it with the Yamirei and Yamibito. The "morning" (8:00~) that comes to Yamijima of the Reflected World is due to the light from the afternoon on real-world Yamijima being reflected in the sky. When night falls again, the pylon connects to the real world and begins to eat away at it. The giant red tsunami is a phenomenon that occurs when Mother links the real world and Reflected World, and is a phantom tsunami that doesn't really exist. People who are swept away by this wave (regardless of time period) are carried to the Reflected World. Also, her cry does not bring about the tsunami, but rather the sound heard when Mother interferes with the outside world sounds like a siren.